Here’s a little treat for those afternoon snack attacks! These mini muffins taste of chocolate but also have a lot of hidden goodness in the form of ragi flour (finger millet flour), whole wheat flour, ground almonds, and ground flax seeds! 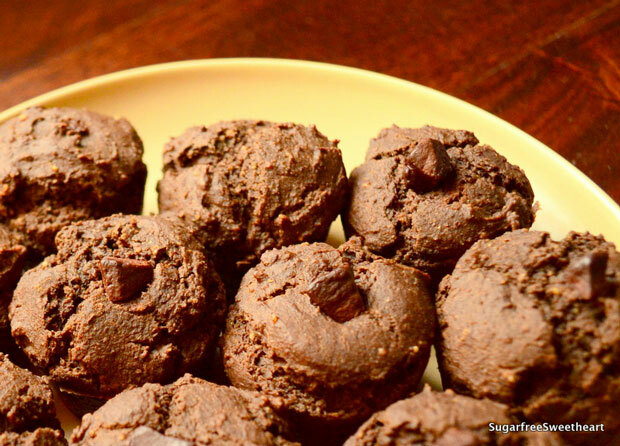 This recipe is suitable for diabetics, weight watchers, and mini muffin maniacs! As always, enjoy in moderation. You can substitute the ragi flour with more whole wheat flour or sorghum flour or more ground almonds. Non-diabetics could use dates (about 1/3 cup) instead of sugarfree powder. The freshly ground flax seed mixed with water (and set aside for 10 minutes) acts as an egg replacement so it helps with raising the flour while baking. Ensure the flax seed is ground finely so that there’s no graininess in your muffins. These look so good! And I love that they’re healthy, too! Oh YES! These sound amazing! Can’t wait to try them; thanks for sharing! Feel free to check out my blog at http://www.BetterOffHealthy.com! You’re right date syrup would work great in this one, especially for those not needing to watch their sugars closely. Thanks for the suggestion Renuka! Excellent post Priya. I have to find the ragi flour now. May be it is sitting in my pantry. You are absolutely right flax flour mixed with water is an egg replacement. It is generally, 1 egg = 1 tbsp flax flour + 3 tbsp water. Going to make it and Will let you know. Do yo u think if I use brown sugar, will that work? :))… She is witty and uses her words very carefully when she doesn’t like it…not hurting mom’s feelings :). I will still use ragi… If not instill the right food choices now,..then never…my husband is a real example of that ;)…..lol…. Poor guy.. But he is my strength too :). Wow Priya, this is the first time I have seen a muffin cake with ragi in it. A very healthy recipe. Since you do not use any eggs or yoghurt, were they soft or dense? How cool is that! Flax seed and water… great Priya. Thanks for the tip.